Well, it’s still Thursday (here), so time to showcase a British Swedish car! Welcome to Thursday Thorsday, a rather forgotten theme. 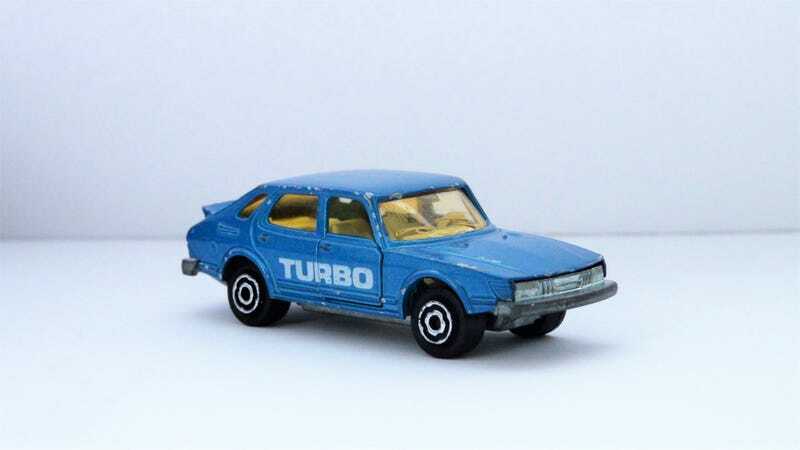 This is Majorette’s casting of a 1978-1987 Saab 900 Turbo 4 door liftback, number 284. As a Majorette, it’s probably roughly contemporary to the real car. This casting was available in this blue with white text, green with white text, and silver with black text, and black with white/silver text. The Saab 900 was introduced in 1978 for the 1979 model year, supplanting the similar Saab 99. Overall, the new model was substantially similar to the old 99, with carryover engines for the first 3 years, and the same hard points, though it did have a lengthened nose. The 900 Turbo models carried the reputation of the 99 Turbo forwards, providing spirited performance in an era of low-compression, low-hp (though high-torque) engines. This casting has nice exterior detail, with hood vents, windshield washers on the hood, quarter panel vents, side rub strip, and a cast-in slightly concave spoiler. Headlight, grille, and tailight details are all well done. The interior has seats with textured detail, and a spoked steering wheel, which we don’t see on basic cars anymore. Notably, on the rear shelf is a racket of some sort. The doors still work as new, as does the suspension. All these Saabs have impressive suspension travel, evidenced by the higher ride height. Like many Majorette and Matchbox of the era, it has a tow hook. Scale is listed as 1:62, and it has the typical late 70s/80s Majorette base. This particular example was a diecast swap meet find from several months ago. It does have quite a bit of paint loss along the edges, and two larger spots on the hood, but I’m pleased to have found this for cheap.